As many new business owners do, Jon Harden was working around the clock and weekends his first few years at AIR. It was one Sunday in February when Pete called. Pete has owned eight aircraft and currently is the proud owner of a Beechcraft Baron. Each year Pete participates in the Bonanzas to Oshkosh (B2Osh) formation migration from Rockford, Illinois to Oshkosh, Wisconsin. “I was expecting to have to leave a message after dialing a couple of options. Instead, Jon picked up, on a Sunday nonetheless! I immediately switched to him and haven’t looked back!” Pete explained. After each flight to EAA AirVenture/Oshkosh, Pete makes a point to stop by and catch up with Jon at the AIR booth in Hangar A. While Jon does not have to work weekends quite as often these days, he still operates at the same level of prompt customer service. Another Beechcraft has found its home at AIR over 18 years ago. Ingrid is often found at Frederick Municipal Airport flying her Bonanza or enjoying AIR’s summer cookouts. But her true pride and joy has been covered through AIR for 17 years now, a newly restored J3 Lenape Papoose. This 1939 Piper Cub is equipped with a 3-cylindar radial engine and is one of only three flying in the United States! This very Cub once held the world record for aircraft time aloft. Ingrid’s Cub graces many of AIR’s marketing materials! Ray was AIR’s 32nd client and he still insures through us today! Besides his Cessna 172, AIR also protects Ray’s 1977 Varga. Known for its reliability and simplicity, Varga pilots could spend the whole day boasting about their aircraft. However, not all insurance markets readily write this make and model aircraft. Since 1999, AIR agent Chris Wolbert shops all the major aviation insurance markets for Ray’s Cessna and Varga each year before renewal. Chris has earned Ray’s business year after year by providing competitive rates for both aircraft and by keeping them on one policy for increased convenience. “I really appreciate what the agents at AIR do because they are pilots, not just insurance agents!” airline pilot Curtis exclaimed. All insurance agents at AIR are pilots and are passionate about the aviation industry they serve. Each pilot has a different background and a diverse blend of aeronautical experience. Curtis is approaching his 19th renewal with AIR. He prefers to keep all five of his aircraft on one convenient policy as well. He currently owns a Cessna 140, Cessna 150, a Piper J3 Cub, an RV-8 and a multi-engine amateur built aircraft, the Wickham B. The Wickham B is the only aircraft of its kind, designed by Jim Wickham, an engineer with Boeing in the late 1960’s. It sat in storage for several decades before being restored in 2002 and later purchased and flown by Curtis. Bob’s 1950 Beech 35 Bonanza is a show stopper. In fact, it has made it to the centerfold of an aviation magazine! Featuring a IO 470 D’Shannon engine upgrade, an advanced avionics suite, and superior paint and interior, his number one priority was properly insuring the aircraft he invested so much into. When shopping for aircraft insurance, Bob encountered the issue that the stated Bluebook Value of the aircraft was much less than the value due to its extensive upgrades. That’s when he connected with Jon Harden, the founder of AIR. 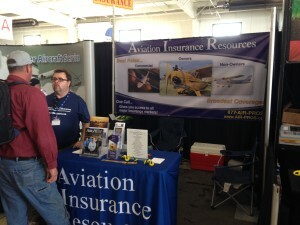 In June, he will be trusting AIR with his aircraft insurance renewal for the 19th year straight! His Bonanza is, of course, still in impeccable shape. Flying out of NJ, Joseph owns a Piper Arrow. 18 years ago, Joseph connected with AIR’s regional office in Bradford, PA, then run by agent Lee McKinley. Since Lee’s passing, Joseph has worked with Victoria Neuville out of AIR’s Frederick, MD headquarters. Despite the years that have passed and the office transition, AIR has been able to ensure Joseph a steady premium and he is now paying less than several years ago! This is because AIR shops all the aviation markets to obtain the best rate. Thanks to a competitive market, Joseph has not seen that much fluctuation in his insurance rates over the years. Having access to multiple insurance carriers also provides flexibility when customizing the right policy before committing to one insurance company’s guidelines. All the previously mentioned clients are aircraft owned for pleasure and business use. AIR’s expertise also extends to workers compensation, FBOs, maintenance facilities, flight schools, charter, flying clubs and more! The oldest aviation sales company still in operation in Oklahoma City also happens to be one of AIR’s oldest clients as well! Southern Wings Aircraft Sales is a very successful family owned business specializing in selling corporate twin and turbine aircraft. Cycling through many aircraft throughout the year, Southern Wings insurance policy allows for sales and demonstration of the aircraft. The ease of adding and deleting newly acquired or sold aircraft can be attributed to AIR’s prompt service and organization. AIR is well equipped to insure your airshow or aviation event. But what’s more fun than insuring airshows is attending them! 2018 will mark the 19th consecutive year AIR has had a booth at EAA AirVenture, commonly known as Oshkosh, the world’s busiest airport for one week each July. Each year you can find us in booth 1120, next to Trade-A-Plane. Oshkosh is comparable to a family reunion, but for pilots. This is often where we meet our customers in person. 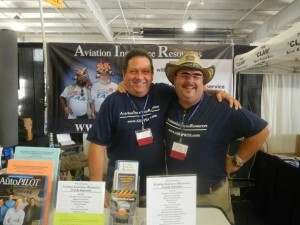 “I’ve been attending AirVenture since I was 10 years old. What’s great about being an exhibitor is all the new people you meet and finally putting a face to the name or voice of our customers,” said AIR agent Victoria Neuville. As AIR’s 19th anniversary approaches much remains the same. AIR continues to provide service with integrity from a group of knowledgeable insurance agents and pilots. The proof is in the numbers, over 80 clients have had coverage with us for 18 consecutive years! To begin creating a life-long relationship with an aviation insurance broker that shops all the markets to provide you with the best rates and the broadest coverage call 301-682-6200 or visit www.AIR-PROS.com today! 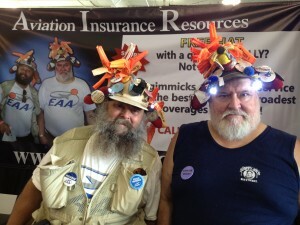 Oshkosh, WI – July 30, 2013 – Year after year, friends come back to EAA AirVenture to share their love for aviation. Some friends have just started in this new tradition and others have been doing it since AirVenture’s inception. Our friends Jeff “Rocco” Emanuel and Jeff Barrette have been a staple at Oshkosh for many years and never leave without paying a visit to Aviation Insurance Resources (AIR) in Building A, Booth 1141. Dubbed the “AIR-Bros” by their friends at AIR, the hangar chat quickly turned to a lasting friendship. Later, the two best friends would become AIR’s favorite ad on the back cover of Aviators Hot Line. While discussing how many insurance companies often focus on free hats and giveaways instead of quality customer service, AIR remembered one of their favorite photos of the AIR-Bros wearing hats donned with collectable windsocks and pins. This fun photo quickly became a new backdrop at their Oshkosh booth and a new ad. Following a fun-filled autograph session on Monday, the AIR-Bros have agreed to return to the AIR booth on Wednesday, July 31st at 11:30AM for a second session. Stop by the AIR booth in Building A, #1141. Everyone is welcome and free copies of Aviators Hot Line will be available for the Bros to sign. Oshkosh, WI – July 24, 2013 – Year after year, friends come back to EAA AirVenture to share their love for aviation. Some friends have just started in this new tradition and others have been doing it since AirVenture’s inception. 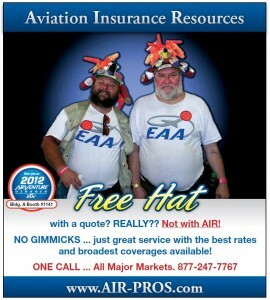 AIR will host an AIR-Bros autograph session on Monday, July 29th at 11:30AM at their booth in Building A, #1141. Everyone is welcome to bring their copy of Aviators Hot Line for the Bros to sign.